The CMS (Compact Muon Solenoid) experiment aims to discover new particles and study their properties. Scientists from the Particle Physics Research Group at the University of Bristol are currently working on upgrades to the Large Hadron Collider (LHC), the particle accelerator and collider located at CERN (the European Organization for Nuclear Research) near Geneva, ahead of its restart in 2015. The LHC made headlines worldwide in 2012 with the discovery of the Higgs boson, an elementary particle whose existence explains why some fundamental particles have mass. The Higgs is pivotal to the Standard Model and other theories within particle physics, and its discovery has opened up a huge range of new research. Bristol scientists are currently working on two experiments at CERN: the CMS (Compact Muon Solenoid) experiment which aims to discover new particles and study their properties, and the LHCb (Large Hadron Collider beauty) experiment, exploring what happened after the Big Bang that allowed matter to survive and build the Universe we inhabit today. The LHC has been in shut-down mode since March 2013 while scientists and engineers upgrade the detectors to allow the analysis of collisions at higher energy and intensity. 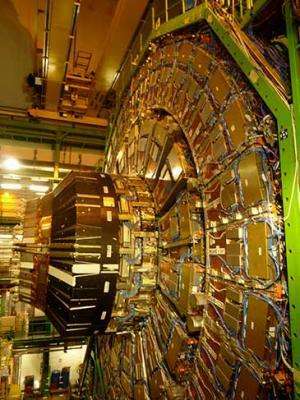 When the collider restarts next year, it will be able to collide particles at twice the current energy. Dr Sudarshan Paramesvaran and colleagues are currently working on upgrades to the Level 1 'trigger' system for CMS. Around 40 million collisions per second occur in the detector so trigger systems are needed to automatically 'sift' this huge amount of data at very high speed, selecting and recording only those events of interest. The LHCb (Large Hadron Collider beauty) experiment is exploring what happened after the Big Bang that allowed matter to survive and build the Universe we inhabit today. Dr Paramesvaran said: "The trigger is, in my opinion, probably the most important aspect of the detector because if you can keep more of the events that you want and discard more of the non-interesting events, you have much better data to analyse. "The Level 1 triggers make the first decisions about which events to keep using not computers but electronics components called FPGAs (Field Programmable Gate Arrays). Obviously, electronics technology has improved massively since we first installed triggers in CMS so now is a good time for us to replace the existing system with really high tech units that are much better and quicker and so will optimise data collection when the collider is switched on again." Dr Marco Adinolfi and colleagues work on the LHCb detector, where the upgrade process is informed by the previous three years of using the detector and also the considerable progress in technology since it was designed at the end of the 1990s. Dr Adinolfi said: "The LHCb detector is special as it is looking in places where the other detectors at CERN don't look, thus producing complimentary results. 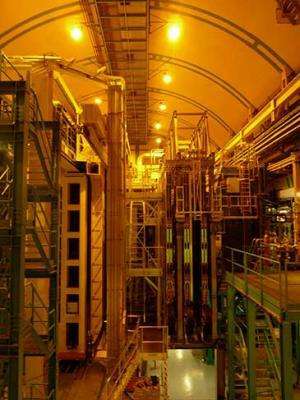 "The Bristol team is working on part of the detector which identifies whether particular particles are pions, electrons, protons, and so on. This upgrade will mean the detector will be much more efficient at recognising particles at the new accelerator energy; that's where we're targeting our improvements. At the moment, we are very good in some energies but not others so that's where we're targeting our improvements. "There isn't one single change to be made, like a lever you can turn up to improve everything, but lots of little changes. Each one gives a couple of per cent improvement but when you put them all together you get something much, much better." Work also continues at Bristol on analysing the huge amount of data generated during the previous run of the LHC.